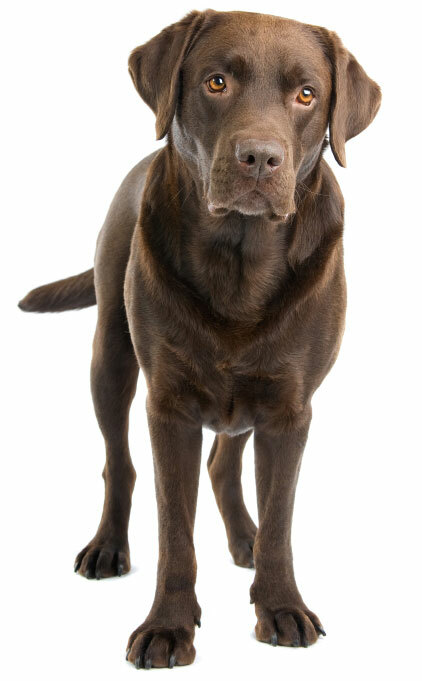 Learn about the temperament and personality of the Labrador Retriever. Discover what he's like to live with, his traits and characteristics and how he generally behaves. And look at lots of Labrador Retriever photos. The Labrador Retriever is the most popular dog breed in the United States (and Canada and Australia). He's owned by millions of people! Labs are loving, people-oriented dogs. They are very loyal and loving to their families. Labs are friendly, happy-go-lucky dogs prized for their stable and reliable temperaments. Labs are good-natured and trustworthy. They're dependable and easy-going. Labs are very stable, they aren't easily upset or startled. They're eager to please you; always seeking your approval. Labs are very affectionate with their families and desire plenty of close physical contact: tummy rubs and behind the ears scratches. They thrive on human companionship and attention. They always want to be with you and will follow you around everywhere you go! They'll lie on your feet, sit on your lap, and lean against you! If you don't like being followed around and having a dog in your face all the time, then a Lab probably isn't for you -- because he just wants to be with you! He will greet you enthusiastically at the door with a wagging tail and kisses every time you arrive home. Labs are highly intelligent, highly trainable, and learn your commands very quickly. They also love to chew things! They'll mouth and chew anything they can get their mouths around. They also love to carry things around in their mouths. Labs are friendly with everyone! They get along well with other dogs and strangers. Labs aren't "one-man" dogs because they enjoy the company of everybody! Labs are gentle and patient with children, even if the child's behavior is bratty. They love to run and play with children but care should be taken as they may accidently knock over a small child while playing with them out of over enthusiasm. Labs physically grow very quickly, but continue acting like puppies until they're about four years old. So you'll need to give him plenty of obedience training if you want to keep him under control. He loves to play with and chew on his toys. He'll play with you at any opportunity he gets! His favorite game to play is fetch. He'll fetch a tennis balls for hours, and he'll fetch the morning paper for you too. He loves to swim and will fetch things out of water. If he spots a puddle or water or mud he'll probably jump in it and then lay in it. He doesn't mind getting dirty and he'll bring mess back inside the home, so if you're a clean-freak he might not be the best dog for you. He also doesn't mind getting his face wet when he has a drink from his water bowl so expect a wet floor and wet kisses after he's had a drink! If wiping up water with a towel doesn't amuse you then a Labrador isn't for you. He'll probably retrieve things like a dead fish or a dead squirrel and bring them to you (it's his instinct). Because he likes to take things into his mouth he's also prone to swallowing things that he shouldn't, like socks, toys, or bones which can cause intestinal blockage. His tail can swipe the items off a coffee table in one clean sweep. He is not a guard dog and is more likely to lick an intruder to death than to be aggressive with him. However, he will provide you with a warning when someone approaches by barking at them. He's athletic and strong and has plenty of energy. He makes a great hiking and jogging companion. If he gets lonely or bored or doesn't get enough exercise he might misbehave by digging holes, barking, or destructively chewing things. So each day be sure to spend time with him, play with him and give him some exercise (thirty minutes a day playing fetch and allowing him to romp around outside will allow him to release his pent up energy). A Lab can live quite happily in an apartment without a yard so long as he gets to go for a walk and a run outside every day. If you have a yard it needs to be fenced or he will wander away. Besides being a excellent family pet he also excels at therapy work, as a guide dog, in the agility ring, at obedience competitions, in hunting, as a search and rescue dog. 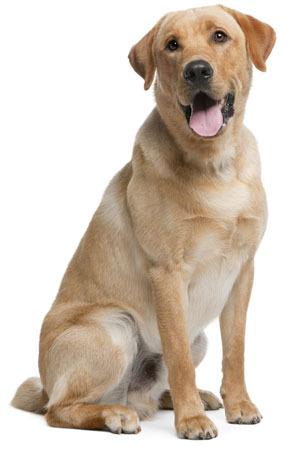 The Labrador Retriever is the most intelligent and easiest to train of all dog breeds! He learns new commands quicker than any other breed, which makes him very easy to train. The Labrador Retriever sheds a fair amount of hair. You'll find hair stuck to your couch, carpets, clothes and everything else in your home.